In 8-inch skillet, cook beef over low to medium heat until no longer pink, breaking up beef with wooden spoon or spatula. Stir in tomatoes, Italian seasoning and garlic; season to taste with salt and pepper. Cook 3 minutes longer. Remove from heat; stir in Parmesan cheese. On lightly floured work surface, split each biscuit into 2 rounds. With rolling pin, flatten each biscuit round into 4-inch round. Spoon small amount of beef mixture in center of each round; fold dough over to form semicircles. With fork or fingers, seal edges. Arrange on cookie sheets. Bake 18 to 20 minutes or until golden brown. Remove from cookie sheets to serving plate. Serve warm with your favorite marinara sauce, if desired. If you prefer, you can use a mixture of ground pork and ground beef for the filling. The empanadas can be made a few hours ahead of time. 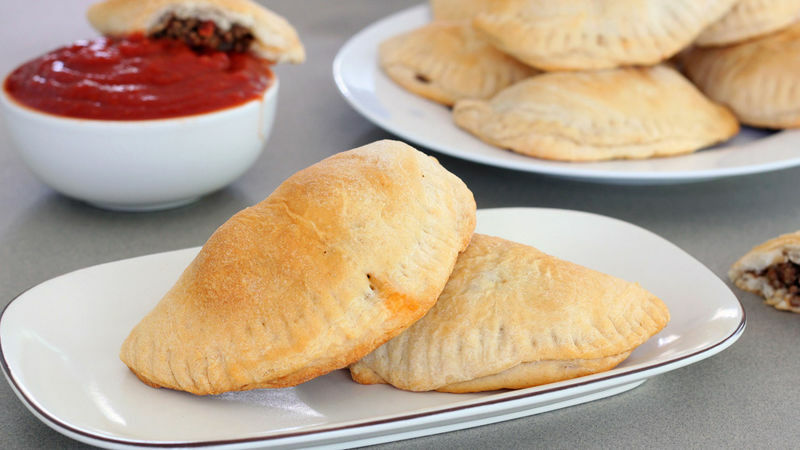 Assemble the empanadas, cover with plastic wrap, and refrigerate. When needed, just bake in a preheated oven.